Summary: You can face a serious eye infection if you do not properly clean your contact lenses exactly as directed. Contact lenses are delicate vision correction tools that require cleaning and good hygiene techniques. Here are some tips on how you can get started. Contact lenses that are old or do not fit well can damage your eyes. Moreover, they can also cause blood vessels to grow into the cornea, which is a dangerous condition that requires invasive surgery. It is important to remove your contact lenses at any time if your eyes are red, watery, or sensitive to light. You should also do the same if you have blurred vision or notice any discharge coming from the infected eye. You must take action each and every day you wear contact lenses. Whether they are multifocal lenses or astigmatism contacts, it is important that you remove them from your eye before you put the lens back in. Now, there are many types of cleansing systems available from your local retail store. The choice depends on the type of lens that you are currently wearing, if you have allergies, or if your eyes are prone to forming protein deposits. Be sure to ask your eye doctor what is best for your specific contacts. 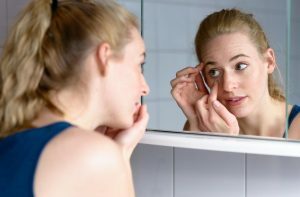 In order to avoid dangerous eye infections, be sure to follow the schedule that your eye doctor provided, remove your lenses before taking a shower or swimming, wash your hands before touching your contacts, and follow directions from your doctor and from the lens cleaning solution manufacturer. If you order contacts online from a supplier like Lens.com for example, it is important that you check the box of the contact lens as it may have further instructions that could help you.